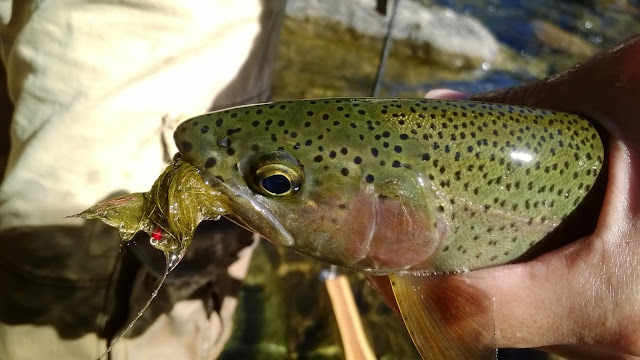 Streamer fishing is one of the least used tactics I see anglers using when I'm on Northern California water. Many anglers live and die by the indicator and although they may catch a lot of fish, they lose out on one of the most dynamic and fun ways to fish. Throwing streamers is as KISS (keep it simple stupid) as you can get. Tie on a streamer pattern, throw it across the river, strip it in, and cover water. ...and that's all there is to it. There's no way it could be that easy you say? I use to think the same thing and boy was I wrong. It is that easy. Many anglers have forgotten about their days with spinning gear. Fishing with lures is basically streamer fishing. The advantage a fly angler has however is that they can dramatically slow down their presentations and easily throw flies that move much more naturally in the water. Spin anglers have an advantage fishing deeper water that fly rods can't get to. Either way it's the same concept; imitating baitfish to fool a fish into biting. Here are a few things that I've learned that might help convince you to try streamer fishing. 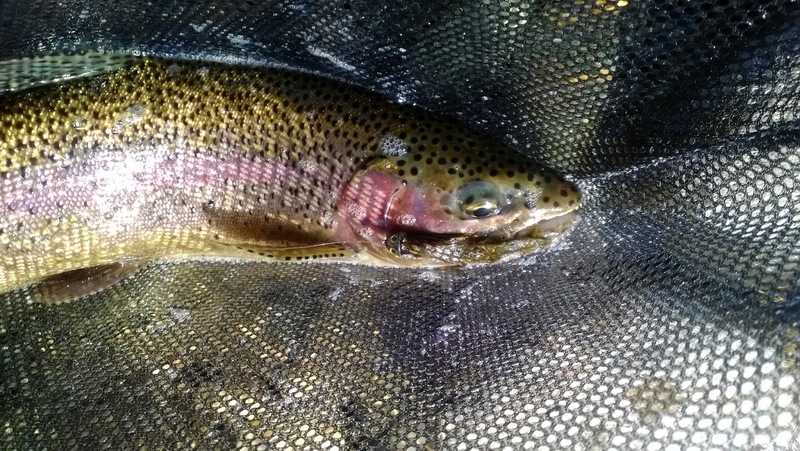 This post is mostly in reference to streamer fishing for trout in moving water. Fish are more willing to chase a streamer when the water is warmer in the spring, summer, and fall. Winter can be a tough time of the year to get a fish to eat a streamer. Cold water temperatures slow down their metabolism making them slow and lethargic. During the colder months try slowly swing your streamers instead. This will allow your streamer to stay in the strike-zone for the longest amount of time in order to trigger a territorial strike. I've had the most success fishing streamer patterns that are around 2'' - 4''. Streamer fishing is dynamic. Movement is key. You are looking for a big fish that either wants to kill or eat. Don't fish one run all day long. From my experience fish usually won't react to a streamer if they've already seen it once. Keep moving. The dynamics of stripping in your line makes throwing streamers very different from swinging them. Think reaction strike. You want the fish to react on instinct. Keep your retrieve steady. Varying your retrieve and presentation can also help you get more strikes. I find that most fish will strike when stripping in line from a swinging motion or at the hang-down. This one is a bit tricky and takes some practice. You basically need to let the fish hook itself. If you feel a hit don't react, just keep your retrieve steady until you feel the fish really grab it. When they grab it, set the hook in a sweeping motion downstream to ensure that you don't pull the hook out of it's mouth. The small hits you feel are called "short-strikes". These short strikes are the fish whacking the fly but not eating it. If you attempt to set the hook during a short strike you will spook the fish. If you get short strikes but not a good grab, try a second time. If nothing, move on. Kelly Galloup states that "50% hook up days are really not uncommon at all, and on the great days it will be around 70% hook ups, that's just part of it." Olive sculpin patterns are absolutely deadly in NorCal. My Hero Sculpin is what I like to use and it totally rips lips in all the places I've fished it. My recommendation for those who need to gain some confidence in streamer fishing would be to fish a woolly bugger; the ultimate streamer pattern. If in doubt, fish the bugger. I use a 10ft extra super fast sinking (7ips) poly/versileader with about 4-5ft of 10# mono. This rig works well and for the most part hits the water column just right. Cast upstream, mend, let the versileader sink, and when the streamer starts to swing start retrieving line. My go to rod for streamer fishing is my 9ft 6WT but I've used appropriate sized streamer patterns on all of my rods from a 2WT to 7WT with great success. If the fish are really willing to chase they'll come up to about 6'' below the surface to attack your fly which is incredible to watch. The only way you can get better at streamer fishing is by doing it. Don't be afraid to experiment and get skunked. I guarantee you that once you hook your first big fish on a streamer you'll wonder why you didn't start streamer fishing sooner. Just do it. Kelly Galloup is my streamer fishing hero. Watching his videos and reading his stuff helped me gain enough confidence to start throwing streamers. This video helped me a lot. This gives me hope! I getting back from fly fishing after close to 10 years of not fishing. I decided to get back to fishing and fell in love with Spey casting. I am sure that I can alter the "swing" by doing the strip for the retrieve . I have a 4wt switch rod (translates to a 6wt single?). I really do wish to fish with you someday. I did fish the Yuba last week and caught a fish nymphing but I just hate the whole nymphing and lobbing a bobber. Lobbing bobbers does get stale after a while. What I like to do is think of them more as a tool rather than a necessity. If I can high-stick where I'm fishing then I don't put one on. If I'm fishing a deeper, leveled, and slower current I put one on. Adjusting your indi for depth control also adds some thinking to the mix that will catch you more fish. Stripping streamers takes my number two spot with swinging flies as my personal number one ultimate thrill. Shoot me an email mattvang13@gmail.com if you ever want to meet up, I'd be more than happy to accompany you.